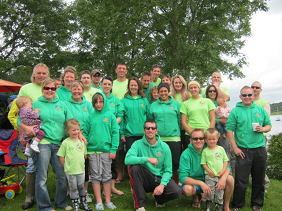 Well done everyone for fundraising to get our new boat, oars and trailer. Big thank you from everyone at the club to Charlie for collecting. Dolwen – Our Brand New Celtic Longboat! Dolwen has her first launch off Aberporth Beach! Dale Sailing recently finished building our Celtic longboat and we wasted no time in picking her up. A huge thank you again to Charlie for driving to collect her from Neyland. Bring on the new WSRA season! Tilly Whim Arrives in Aberporth!! Like buses! 6 months of trying to get are hands on a Celtic Longboat and then 2 come along together. In March 2010 Swanage Rowing Club put their Celtic Longboat on the market and we made them an offer which was accepted. The road trip was on! Charlie very kindly offered to drive to Exeter to collect the boat and the club gives you a huge Thank you! Oli & Andy also made the trip down to Exeter to keep Charlie awake. Our Brand New Shiny Celtic Longboat is on order with Dale Sailing! That’s right, Clwb Rhwyfo Aberporth Rowing Club will soon be the proud owner of its very own Celtic Longboat!!!!! 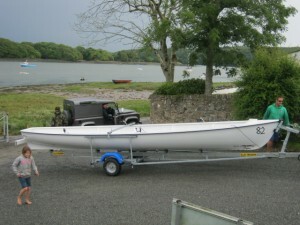 The order is in with Dale Sailing and should be ready for its maiden voyage off Aberporth beach in March 2010. Huge thank you to The Sports Council of Wales, our sponsors, companies / individuals that have made donations and everyone associated with the club that has helped raise the money. Well done everyone! After a long day on Sunday we have got a boat back in Aberporth. It needs some work which will be carried out this Saturday, weather pending. We hope to have it back on the water the week after. Thank you again to Aberystwyth Rowing Club for lending us Draig Y Mor and also thank you to Llangrannog Rowing Club for letting us borrow their trailer to collect her. 19th Aug 09 Great News – We’ve got a BOAT! Aberystwyth rowing club are lending us a Pembrokeshire longboat! The boat needs a little TLC but hopefully will be ready for its first outing in Aberporth next week. Check back here on Sunday evening for news of the next training session. A huge thank you to Aberystwyth rowing club, everyone at the club is itching to get back out on the water and you have made this possible. Nice one Oli, your perseverance has paid off!